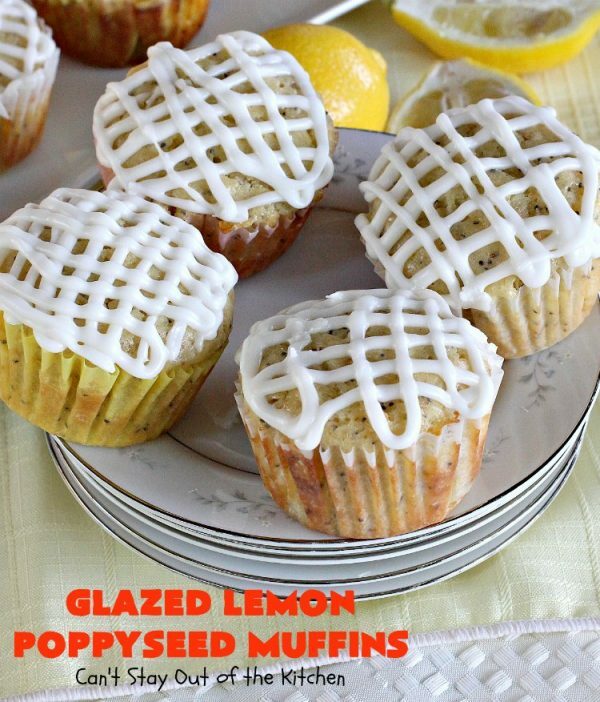 Glazed Lemon Poppy Seed Muffins are some of the best muffins you’ll ever eat! 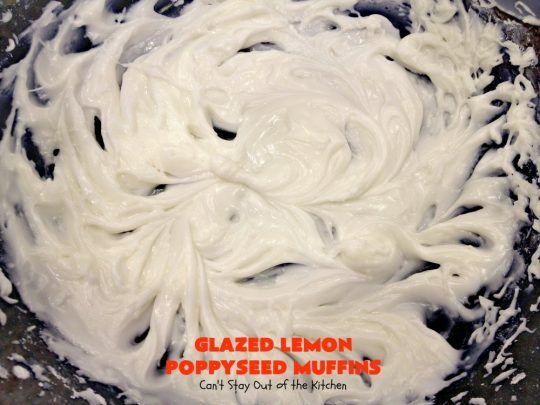 These spectacular muffins are filled with lots of lemon juice and zest, Greek yogurt and poppy seeds. Then they’re glazed with a luscious butter-lemon-powdered sugar glaze that make them incredibly wonderful. 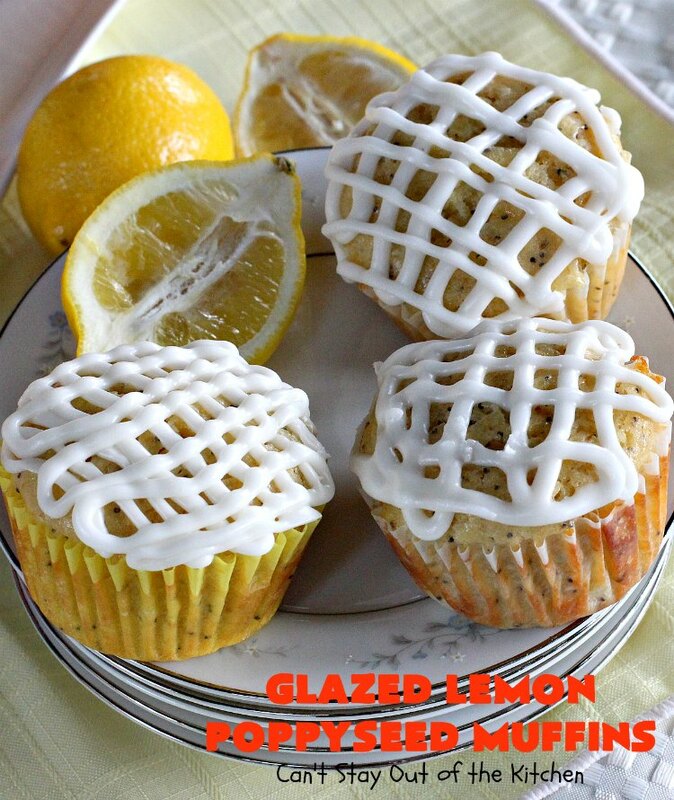 These scrumptious muffins will have your mouth watering before you even finish glazing them! The smell of the lemon will ignite your taste buds. Before you know it you will have gobbled down two or three of these fabulous muffins! I made these in regular muffin tins, but you could also make these in miniature tins or muffin top tins and they would come out equally well. These marvelous breakfast treats are great for special breakfasts, holiday entertaining, or just because! I was taking a meal for someone recovering from surgery a couple of weeks ago and I wanted to throw in something for their family to eat for breakfast. I started looking through all my Pinterest finds for “Yummy Breakfast Ideas” when I came across the pictures for these sensational muffins and decided to give them a try. I was SO glad I did. I thought they turned out incredibly tasty. The original Bon Appetit recipe doesn’t include the glaze or the Greek yogurt. The glaze and the Greek yogurt was first added by a food blogger here. And when I found the recipe here, the glaze was modified even more, and the Greek yogurt changed to sour cream. 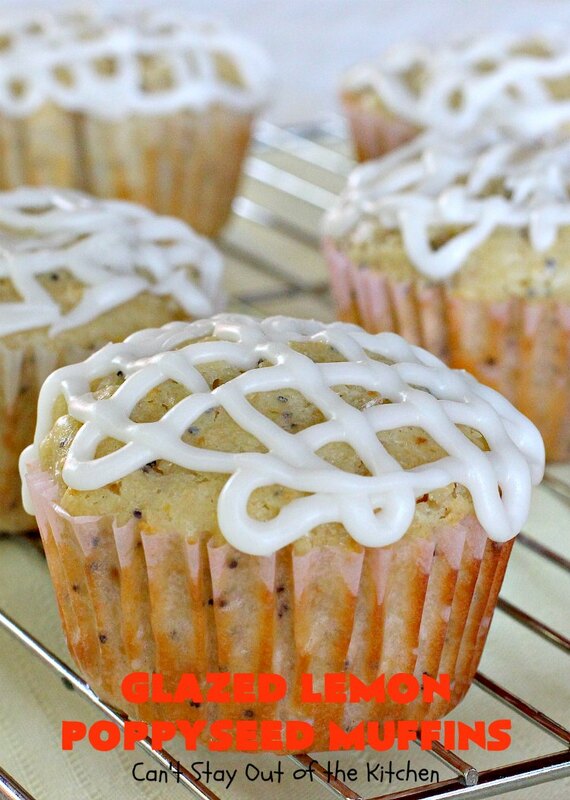 The glaze MAKES these muffins, in my opinion. Adding butter flavoring to the glaze offers a depth of flavor you can’t get merely from a powdered sugar icing. I followed the third rendition of this recipe but went back to the Greek yogurt instead of using sour cream. 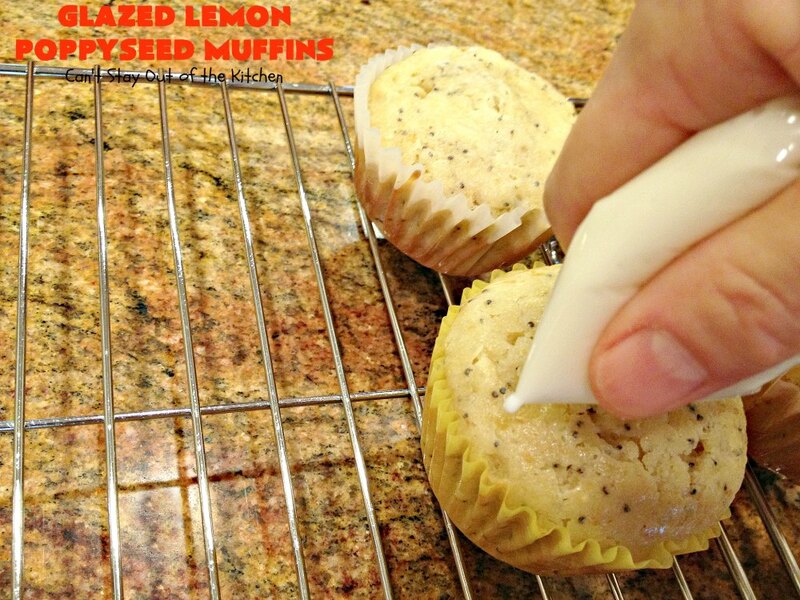 Glazed Lemon Poppy Seed Muffins turned out wonderfully. 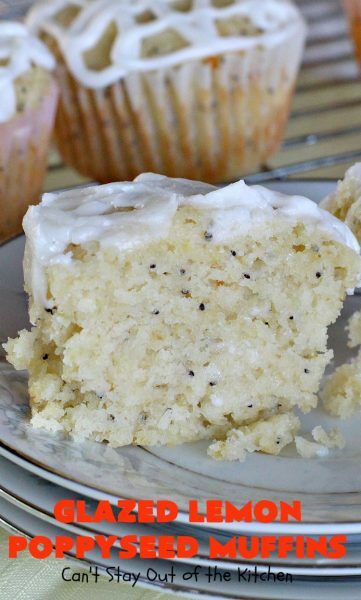 This is a luscious tasting muffin to include in a breakfast or brunch buffet. It’s also great to take along to baby or bridal showers. 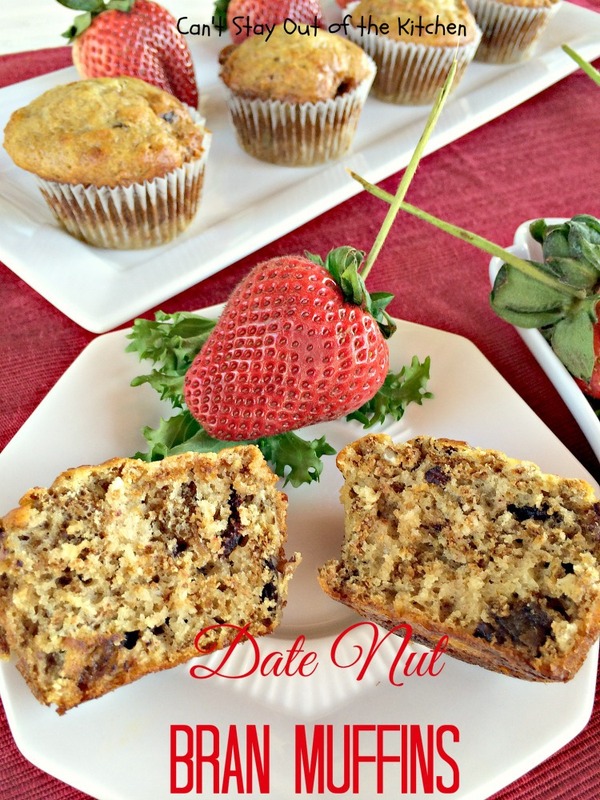 Consider whipping up a batch of these tasty muffins sometime soon. But be prepared to have them vanish in only a few minutes! The ingredients are available year round, and these really aren’t all that difficult to make. 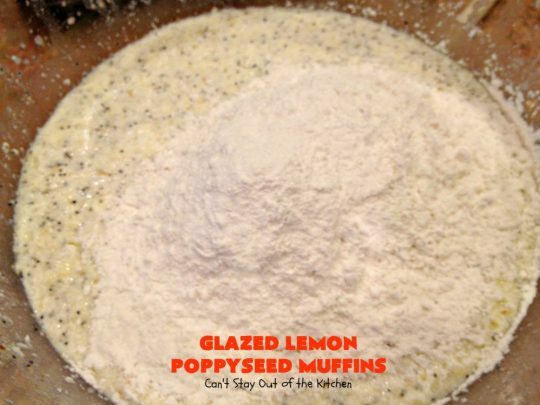 Glazed Lemon Poppy Seed Muffins can be ready to eat in about an hour or so. I guarantee you’ll have your whole family drooling over these amazing muffins. Your neighbors and friends probably wouldn’t mind being treated to one either! 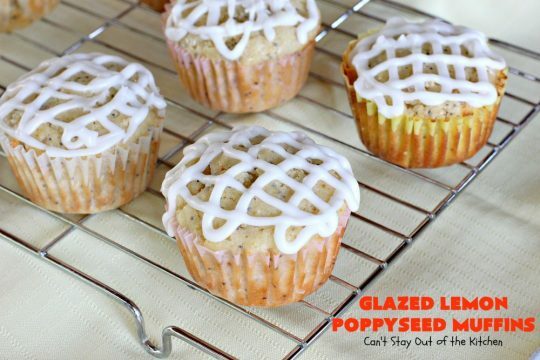 Glazed Lemon Poppy Seed Muffins are one of the best muffin treats you’ll ever eat! The lemony taste of these muffins is provided in the juice and zest in the muffin itself, and then in the glaze icing as well. Glazed Lemon Poppy Seed Muffins are a wonderful treat to wake your family up to for a great Saturday or Sunday morning breakfast! 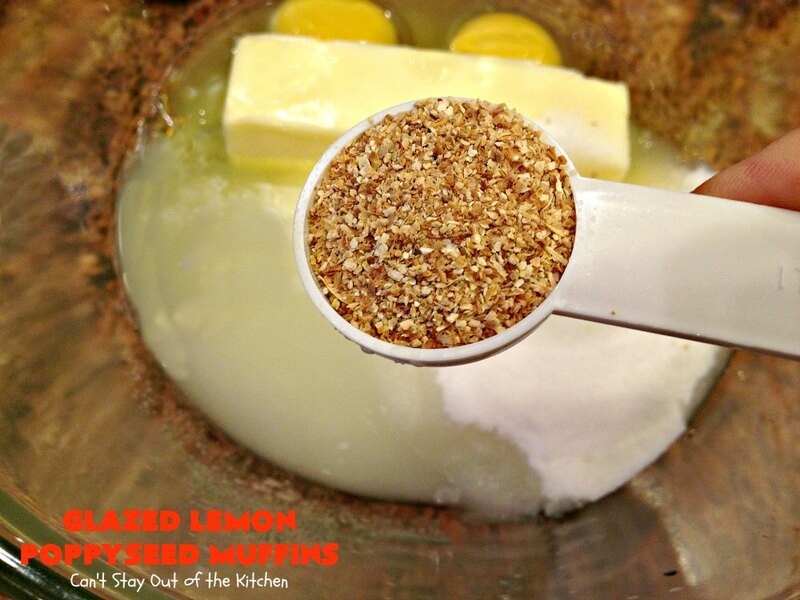 The butter extract in the glaze provides that extra oomph that makes these muffins so special. A single batch of these muffins makes about 14 regular sized muffins. Soften butter and place in large mixing bowl. Add eggs, sugar, lemon juice and lemon zest. You can also grate your own fresh lemon zest (which is better), but I was on a time crunch and had to get these done rather quickly. Add salt, baking soda, and baking powder, Chobani vanilla Greek yogurt, buttermilk, poppyseeds. Mix all ingredients with an electric mixer. Stir gently with a wooden spoon to combine. There will be lumps in the batter but don’t over-stir or over-mix or you will have very tough muffins. 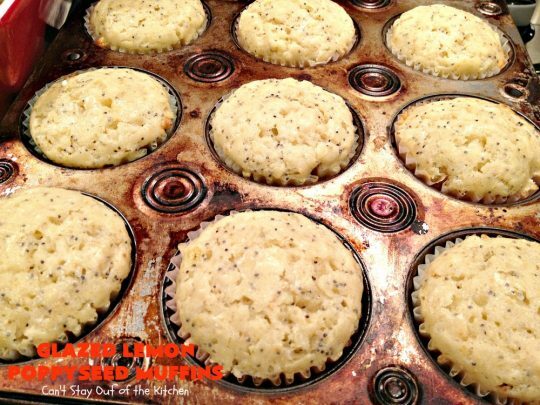 Place paper liners in large muffin tins. Spoon batter into tins until about 6/8 to 7/8 full. Bake at 350 about 20-23 minutes. DO NOT OVERBAKE or the muffins will dry out. Allow the muffins to cool a few minutes before applying glaze. To make Lemon-Butter Glaze: Place butter extract into medium sized bowl. Add lemon juice and powdered sugar. Use just enough to make of spreading consistency. I used a SCANT cup of powdered sugar. (That means this is just UNDER a cup of powdered sugar). Spoon icing into a zip-lock bag. Cut off the corner and pipe the icing onto the cooled muffins. Glazed Lemon Poppy Seed Muffins turned out sensationally! These fabulous muffins will have you drooling in no time! These muffins don’t brown a lot in the oven so be careful not to allow them to overbake because you don’t think they’re quite ready. Insert a toothpick into the muffin after around 20 to 22 minutes of baking time. If the toothpick comes out clean the cupcakes are done. This side view shows the scrumptious texture of these luscious muffins! Glazed Lemon Poppy Seed Muffins are a great treat for your family any time of the year. These muffins are also great to provide for holiday breakfasts when you’re sleeping in a little! Your family will wake up to the smell of these fabulous muffins and head to the kitchen quickly! These moist and delicious muffins are filled with poppy seeds and lemony flavor from lemon juice, lemon zest and lemon in the glaze. They are so mouthwatering you won't want to stop eating them! Terrific for company or holiday breakfasts like Easter, Mother's Day or summer holiday fun. In a large mixing bowl, blend softened butter, sugar, eggs, lemon juice, lemon zest, Greek yogurt, buttermilk or sour milk, baking powder, kosher salt, baking soda and poppy seeds with an electric mixer. Slowly stir in flour, just until moistened. There will be lumps remaining in the batter—that’s okay. Place paper cupcake liners in muffin tins. Fill a little more than ¾ full. Reduce heat to 350° and continue baking about 15-19 minutes, or until toothpick inserted in center comes out clean. Prepare glaze: place butter and lemon juice in a bowl. Add powdered sugar and mix with an electric mixer until you have a thick but spreadable consistency. 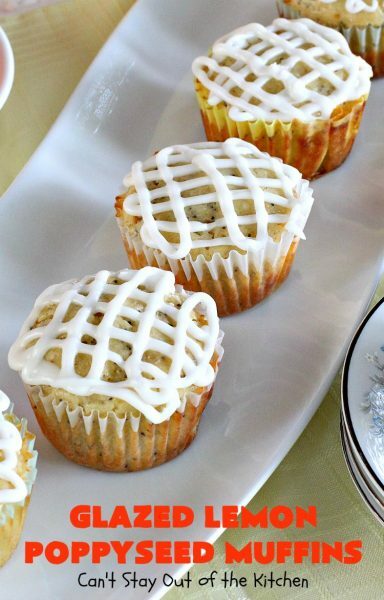 Drizzle icing over warm muffins. Serves 14 regular size muffins. Recipe adapted from Thibeaults Table; recipe source: Bon Appetit. 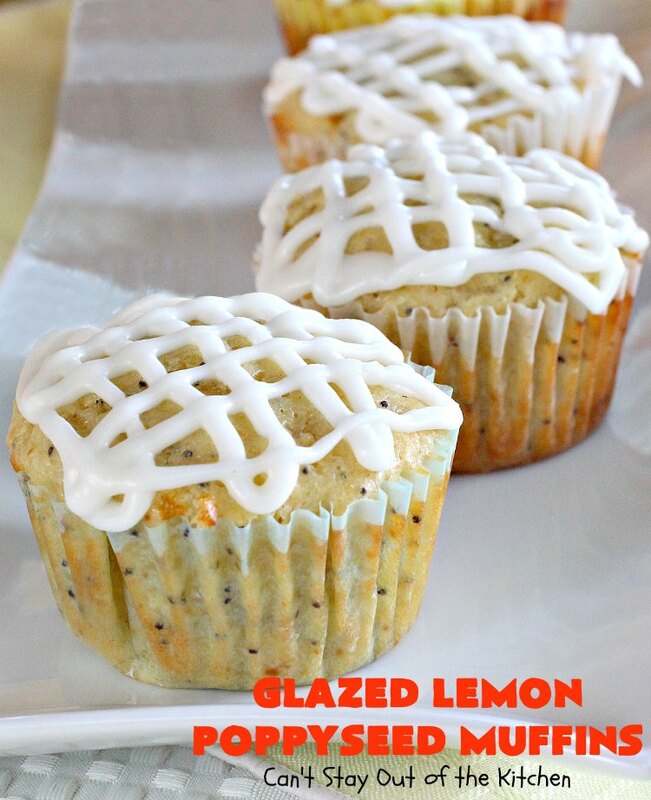 This moist and delicious muffin is filled with poppy seeds and lemony flavor from lemon juice, lemon zest and lemon in the glaze. 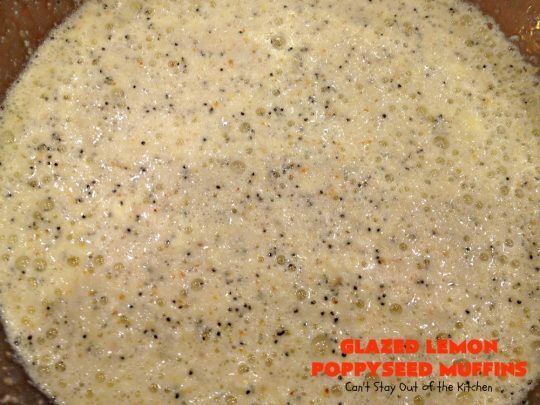 In a large mixing bowl, blend sugar, eggs, lemon juice, lemon zest, Greek yogurt, buttermilk or sour milk, baking powder, kosher salt, baking soda and poppy seeds with an electric mixer. The Greek yogurt and buttermilk in the recipe makes the texture nice and moist. For the record, I am NOT compensated by Chobani for saying so, but I do love their products. 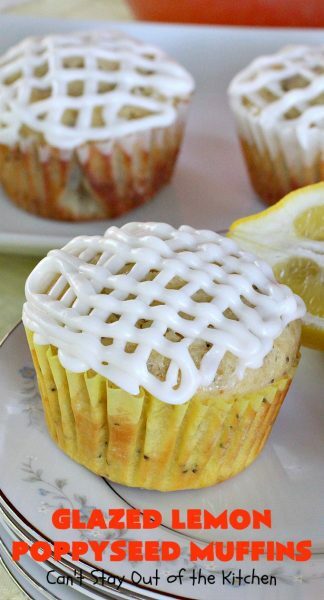 Your kids will love eating a couple of these tasty muffins for breakfast. If you love muffins for breakfast, you will love sinking your teeth into one of these sensational muffins. Don’t these Glazed Lemon Poppy Seed Muffins look wonderful? – Are you salivating yet? I had to give these away to someone else or I would have eaten the ENTIRE batch myself! Are you ready to try a sample? Uh, what about the stick of butter you list? I got all the way through the recipe and still had a stick of butter. Darn! They are in the oven now. Oh, Jeanine, I am SOOOO sorry. I had where the butter was included with the pictures section, but somehow skipped it on the regular directions. It was supposed to be included in the beginning with the sugar and eggs. Thanks for bringing this to my attention. I apologize if they don’t turn out well with this go. Yum! These look so good! I love the piped frosting look. By the way, your food photography is really improving! I love how you styled these pictures with lemons, linen and pretty plates. Very nice! I’ve pinned it! Thank you so much, Bethany. I try really hard. I could do a lot better if I had light room 4 or photo shop. That is on my next list of things to get! Many times I have better pictures but they are too dark so I have to settle for what is the clearest. Being able to touch up photos will be a big help! now that you mention it, I am salivating. Is all your fault! These look delish.